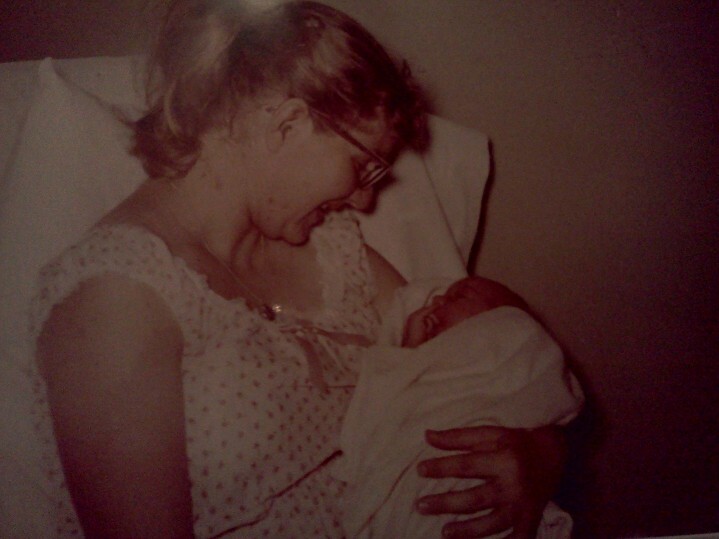 With the recent passing of my Mom, I’ve been immersing myself in memories, keeping her alive in my heart. We didn’t always get along or agree on things, but Mom is the single biggest influence on who I am. Some years ago, I assigned my students to write a poem with a particular structure–The “Where I’m From” poem. Even though they have a set format, they are cathartic and beautiful. I wrote one as an example, and came across it just this week. Great memories of Mom here. I am from clothes on the line and starched collars, from a 7-Up bottle with a sprinkling lid, wetting wrinkles out of my dad’s shirts and Mom’s capris. I am from a banister, sliding down with my sister when my parents weren’t looking. I’m from the smell of mock orange in the spring, its pretty white petals like snow when seen from the branches of the climbing tree. I am from a gang of kids playing cowboys and indians through the alleys, splashing barefoot through puddles and feeding breadcrumbs to ducks at the park. I am from cornflakes with banana slices in Grandma’s kitchen, the fins of Grandpa’s tan Chevy, and their fancy aluminum Christmas tree. I am from wait til your father gets home, from I’m your mother, that’s why. I’m from fudge cooled in the snow, entire pans of Rice Crispy Treats eaten in front of The Partridge Family and sauerbraten with gingersnap gravy. I am from First Communion, Confirmation and Christmas Midnight Mass; a veil over my blond braids every Sunday. In a brown leather album, my mom kept for me, I am the baby who grew into a girl who vacationed, had birthdays in the park and sat with my cousins on a couch. Here’s the very first picture in that brown leather album. Mom and me, 1959. Before she died, Mom and I called each other every week to have a cup of coffee together across the miles between our houses. 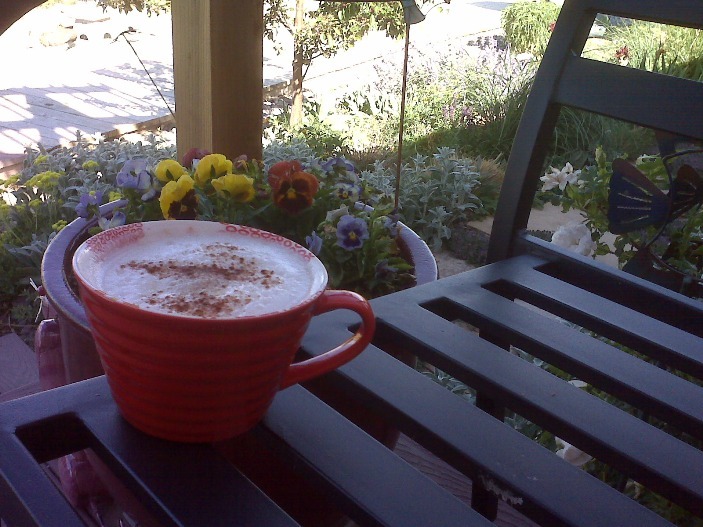 Have a cup of coffee with your mom this week, if you can. I attended a Pampered Chef party a couple of weeks ago and today, my order was delivered! It felt like Christmas morning, opening up the various cardboard and plastic containers, revealing my new goodies. All too soon, all packages were open and I had a pile of empty containers and a display of shiny kitchen accoutrements. I turned each over in my hands, admiring the clear, easy-to-read markings on the measuring cups, the edge and blade guard of the knife. Just like Christmas, I have left them out so I can delight in them each time I pass by. I just can’t bear to hide them away in cupboards and drawers just yet. When this comparison occured to me, I was inspired to take a picture of my culinary treasures on a holiday mat. 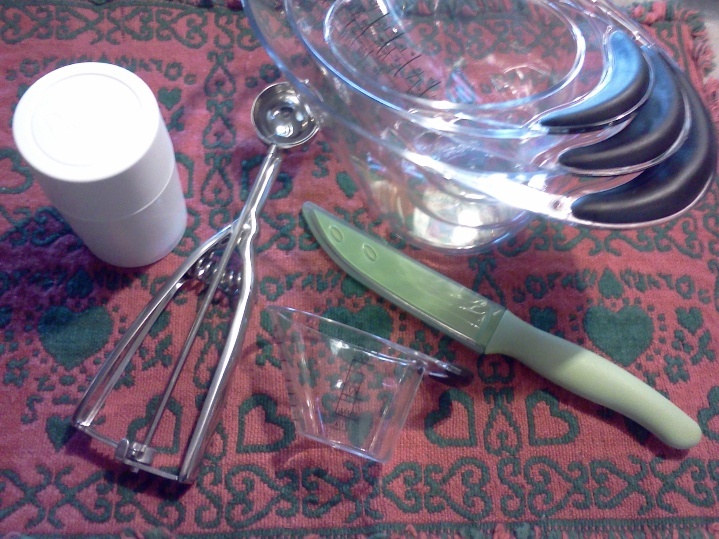 The child or teenage me would never be excited over measuring cups or a cookie scoop. Well, maybe if they came along with an Easy Bake Oven. But still. I’ve been thinking about how my priorities have changed as I’ve aged. As a kid, I carefully studied the Sears toy catalog, constructing a list for Santa. I looked forward to a fabulous coconut-covered cake for my birthday and more toys. The teenage me loved getting clothes. Then I went away to college, got married, moved to an apartment and finally a house. I remember the first washer/dryer I owned. I was so, so happy to not have to go to a laundromat anymore. My latest new washer and dryer–front loaders on pedestals–were ordered as part of a New Year’s sale and delivered months later while I was at work. I hugged them when I saw them. Yes, I hugged an appliance. Lest you think that I’m all about the toys of life, I’d like to share the best gift I ever received: a private saxophone concert from Mr17, who was 15 at the time. He learned a new piece, part of a concerto written by his favorite composer, explaining the significance of the 4 movements, including the one he played for me. Everytime I hear the piece, I’m back on my couch, Mr15, his soprano sax and music stand in the corner, playing just for me. Other gifts that mean the world to me? The people in my life–friends, family-loved ones all. Each visit, each hug, each smile, each kiss are gifts that enrich every moment. A gift I’m giving myself right now is attending a warm yoga class every Tuesday and Thursday morning. The first meadowlark call of the spring, hummingbirds fighting over the feeder, the first tomato of the season, lazily drifting snowflakes on a grey morning, thunderstorms circling the valley, scrunching through big piles of leaves breathing in their warm scent. Delicious food and wine. Mr17’s marching band performing. Kissing the hubby good morning or good night. So many, many gifts each day. I have so much to be grateful for. What are you grateful for? I went with Mr. 15 to his saxophone lesson today. He’s very serious about his music and is currently talking double major: composition and saxophone for college. He owns three saxes–two altos and a soprano–and has another alto (for jazz) and an oboe borrowed from CHS for the summer. He’s teaching himself the oboe because he’s looked into college requirements for admission to a composition program and found he needs to have a wider background in instruments. Music has become his passion and has provided him with a sharp focus for his future. Plus–the part that fills my heart and squeezes tears from my eyes–it brings him JOY. There’s nothing more wonderful than the joy that dances across his face when he’s talking about his favorite composers (John Mackey is one), or sharing music that his music groups have already played/will be playing (scroll to hear the music) or anticipating future years’ guest artists for The Best of the West Festival. He has his music when he needs a place safe from inevitable teen angst. He’s too big for a mom’s kiss to mend his hurts; I’m glad he has something that helps. Sigh….they grow up so fast…I’m proud of the young man who used to be my little boy. Yup–I’m a lucky mom. Right now I’m sitting on my front porch with my laptop…and Mr. 15–who chose to be out here with me–I’m a lucky mom! It’s a lovely evening. The triple-digit heat of today has been swallowed by the evening. A thunderstorm and its lightning lurks just north of here. Mr. 15 is flicking bugs attracted to the light of my screen so I can see what I’m doing. Crickets and night birds are singing in one ear, and Pendulum’s new album: Immersion is playing in my other ear. Mr. 15 and I are sharing his iPod. He has immersed me in a fabulous variety of music I would never think to listen to, and has a great feel for what I’ll like. I love this connection with him. His iPod holds thrash metal, ska, pop, concert and marching band selections, and more–some of which he doesn’t share because he knows I won’t like it. We have an entire summer stretching out in front of us for more evenings on the porch and ice cream on hot afternoons, and granola for breakfast. Ahhhhh…immersed in summer! Lots of stuff sorted, some tossed, some recycled, some packed. Two boxes of my teaching/librarian life came home with me today. Some of the little trinket-y things will make my home desk more familiar. Books will find a home on the shelves of our loft library. This is starting to feel not so bad. Things that have been a part of me for only 191 days a year will now be here with me 365. I’m kinda likin’ this! I’m thinking I’ll be OK. My school family won’t be here, but reminders of them will. In my sorting, I came across something that will tell you if you’re as old as me: a Tribble. Remember the old Star Trek–the one with Kirk, Spock, Bones and Scotty? I watched it growing up and then every day in reruns on the TV in the student lounge of ASC–it came on the hour before the cafeteria opened for dinner. Are ya with me?! “The Trouble with Tribbles? !” The one where the Starship Enterprise becomes infested with Tribbles–brought on board after a shore leave as comforting, harmless little pets. Tribbles are sort of ovoid, furry, fit nicely into your hand and coo when stroked. But then they do the wild Tribble thing, and the ship is overrun. Earlier in the show you find out that Tribbles hate Klingons, and this becomes the day-saver. A surgically altered Klingon has come on board to do some evil and is undiscovered–until a Tribble goes nuts when he walks by! So. I had a Tribble. Furry. Ovoid. Strangely comforting to pet. AND–if you squeezed it it made the Tribble alert noise (hehehe!). The Tribble now lives with the rest of my Star Trek/Star Wars toys in the room of a fellow Jean Luc Picard lover (swoon!). One of the harder things I’ve given up for some reason. And now, the Triumph. Not me. Mr. 15(!) is now the proud carrier of his driver’s permit! Woot! He was pleased enough to text me! We’ve decided to celebrate by toasting each other with our own personal pints of Ben and Jerry’s: Karmal Sutra for Mr. 15, Americone Dream for DH, and Coffee HeathBar Crunch for me: Ching! To the newest driver in the family! May he help with driving duties on the long summer road trip to New Mexico, Arizona and Californ-i-aaaa! I’m very happy for him and hoping to NOT stress him out by showing my stress over the common skill set of a new driver. I’m very lucky in that he is cautious by nature– a good quality in any driver. More to look forward to in the days to come. My end is becoming a new beginning! Who knew letting go would be so hard? Letting go of control over the library I’ve helped to mold into a welcoming, comfortable environment for learning and creativity. Letting go of daily encounters with a staff that has become like family. Letting go of the professional me. When I’m in my library, I feel smart. I feel needed. I feel valued. Some days, I even feel like “super librarian.” Who will I be June 2nd? Someone who used to be a librarian? What IS that? Will my connection to my professional self become like the soft frayed fabric of my jeans; closer to completely tearing with every wash, a hole where the knee used to be? I’ll miss professional me, but I’ll miss my “family” the most. They are passionate–about their jobs, their kids, each other. I have been so lucky to be a part of them. Leaving them is leaving a hole in my heart. I refuse to completely let go of them and really, I suppose the professional me will still be lurking around, ready to pop back out as needed.